The Swiss are the hardest hitting team through the first two games. Yes, you read that right. With Brian “Im’a punch you in the mouf” Burke as general manager of team USA, and for all of Canada’s proclaimed “physicality”, it is the neutral Swiss who are making everyone else in the tournament look a little bit too finesse, a little too cute. Overall, this was the best game of the tournament so far. You could sense the desperation in the building as Canada gave up its 2-0 lead and then proceeded to miss the first 3 shoot-out opportunities. The panic was manifesting throughout the entire arena. “Not again.” “Not like 2006.” Fret not Canada, this may just end up being the wake up call your team needed. Team USA is in the driver’s seat in their Group now (Group A). If Team USA beats Canada on Sunday they will clinch the top seed in the group and an automatic bye to the quarterfinals. If they lose, it is likely that they will have to play a qualification game. Sunday, 7:30pmET, CNBC…The showdown awaits. The Russians lost to the Slovakians late last night in a shootout that lasted 7 rounds. Somehow Slovakia held the Russians to 1 goal. Alexander Ovechkin, Evgeni Malkin, Pavel Datsyuk, Alexander Semin, Ilya Kovalchuk et. al. and they managed 1 goal. That is great team defense and solid goaltending. Stealing a win in the shoot-out when Pavol Demitra sent a beautifully patient flip-shot off the left post and ricocheting into the net was something special. The first upset. It felt good to see Mother Russia taken down early. They are beatable, and it is possible to defend them. Thank you to the Slovakian team for giving everyone else confidence that they can beat the Russians throughout the rest of the tournament. The Olympics are shaping up well. Enjoy the games while you can my friends. Hey Everyone, I don’t have a ton of time, but what little I have has been devoted to watching the Olympic Hockey tournament that started this past Tuesday. I figured I have enough time to write up a bit of my observations over the past few games and hopefully I’ll be able to continue to add some thoughts regarding the upcoming matchups. 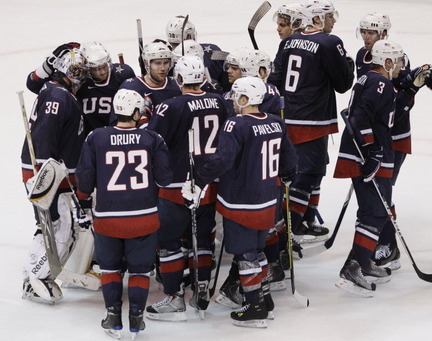 Thanks to NBC for relegating the first two games involving team USA to the USA network (funny, eh? ), while Canada, Russia, Sweden, Slovakia, Czech Republic, Belarus, Norway, Finalnd et. al have all been on CNBC. The coverage design is terrible. It’s as if NBC is actively wanting us to stop being patriotic and hoping that team USA gets eliminated early. Every time I watch a game with Mike Emrick announcing, it somehow seems like the cup finals all over again. This is exciting, because it makes even these preliminary games seem MASSIVELY important. Ice Conditions have got to improve. It’s terrible watching the best players in the world playing the most important tournament for the next 4 years on choppy and soft ice. Watching David Backes and Ryan Callahan on the “4th” line has been wonderful. Backes’ goal against Switzerland on tuesday, going east-coast/west-coast, was simply stunning. He (Backes) has also been a hit machine, consistently dolling out punishment against whatever line he is matched up against. That type of physical play is going to be huge on Sunday against Canada as well as future big games against medal contenders. Callahan is in the same boat. A consistent presence when on the ice. Bobby Ryan has impressed me with his ability to get open for shots when there seems to be traffic all over the ice. He had a beautiful goal against the Swiss and I hope he can keep up the pace he has set. The Defense has been the main issue so far. In my opinion, Rafalski has looked slow in his own zone multiple times. He did have two goals today against Norway, but his play HAS to pick up if the US hopes to have a chance against Canada/Russia/Sweden etc. Jack Johnson and Ryan Suter have been good in the offensive zone, and if they can correctly manage their game, and pinch when appropriate, then they will be a boost to the team overall. Brooks Orpik has been OK, but he seems possibly a step slower than some of the other players out there. Erik Johnson and Ryan Whitney have been scary at times in their ability to make the Swiss or Norwegian forwards look like Dany Heatley and/or Ilya Kovalchuk. Their defensive zone play needs to increase, and outlet passes need to be better or turnovers will cause the losses to pile up to the better teams. Tim Gleason was average, no real complaints for him. This group has the potential to pull of a big upset or two, but they have to play consistent system hockey and not be the cause of too many turnovers. It remains to be seen if they can actually commit to sound defensive system hockey. The Kane/Stastny/Parise line needs to become significant. Honestly, for being the “top” line, this group needs to produce much more. They have put a few points on the board, but for being as skilled as they are, and the competition faced so far, they should be playing much stronger. This group seems weak on the puck at times and I wonder if it wouldn’t be worth moving Kane or Parise down a line to give another player a shot at some chemistry there. Maybe even giving Bobby Ryan a shot on the top line? Malone/Pavelski/Kessel. Leave as is. This is working wonderfully. I hope to see much more out of this line moving forward. Ryan Miller. He is your starter for a reason. With a few great saves already this tournament, he is showing that he was called on for a reason and that he is more than capable of backstopping this team to a medal. He has turned in two solid performances, and he’ll need to be that good or better moving forward for team USA to hang in against the big dogs. Russia: My goodness. The first 10 minutes of their game against Belarus was stunning. Ovechkin/Datsyuk/Semin is scary. This team means serious business and they HAVE to be the favorite to meet Canada in the gold medal game. They showed their offensive skill certainly. The only question marks remain on defense. Can some of the Russian KHL defensemen hold up against competition like Canada/Sweden or even team USA. It remains to be seen. Sweden: From what little I saw they looked OK. Definitely getting their legs under them still. This team just seems a tad bit slow/old. It will be very tough for them to keep up with the pure offensive skill of Russia, the Speed of team USA or the general physical and well-rounded play of Canada. I’m going out on a limb and claiming it is likely that Team Sweden does not win a medal this year. They just don’t seem to have the right balance of defense and good offensive speed to make it happen. Switzerland/Norway: Eh, good teams. Switzerland is certainly the better of the two, and even strong enough to be capable of an upset. It remains to be seen if the Swiss can make an impact like they did in 2006 beating Canada in Torino. Norway, it’s been fun, thanks for playing, but there is just not enough talent on your team to compete at a high level. Canada: I’ll let you know after catching some of the game this evening against Switzerland. Czech Republic/Slovakia/Finland: I need to see more games before saying much about these teams. It’s been a great start to the tournament and I really look forward to the games on Sunday. Great day for hockey with Sweden/Finland, Czech/Russia and USA/Canada. Look at your TV listings and find a way to watch some of this amazing hockey.